Pictures of Villa D'Este Tivoli water gardens a Unesco World Heritage Site, Italy. Photos & Images of Villa D'Este famous fountains. The Villa d'Este in Tivoli, with its palace and garden, is one of the most remarkable and comprehensive illustrations of Renaissance culture at its most refined. Its innovative design along with the architectural components in the garden (fountains, ornamental basins, etc.) make this a unique example of an Italian 16th-century garden. The Villa d'Este, one of the first giardini delle meraviglie , was an early model for the development of European gardens. 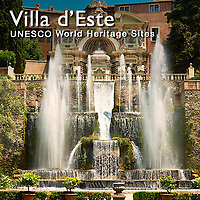 See & buy Villa D'Este stock photos or Villa D'Este photo art prints & cards.